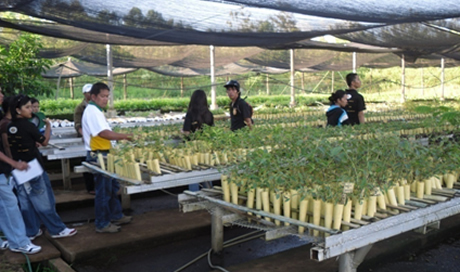 At the CTNI tree clonal nursery. Have you ever seen how they clone trees? Have you seen how goats or carabaos are milked? Have you observed how a sawmill works or how a rubber processing plant works? And, have you savored the scenic beauty and peace that an ecotourism park can offer, far away from it all? Well, a group of junior students of the College of Forestry and Environmental Studies (CFES) of the Western Mindanao State University (WMSU) experienced all these from May 19 to 23 during what proved to be a most interesting educational journey. The students were enrolled during summer in either of the three courses offered by CFES, namely: Bachelor of Science in Forestry (BSF), Bachelor of Science in Agroforestry, and Bachelor of Science in Environmental Science. Part of the course was the study tour. Institutions visited included the MOSCAT (Misamis) Oriental State College of Agriculture and Technology) in CLaveria, Misamis Oriental; ICRAF (International Center for Research in Agroforestry); CTNI (Claveria Tree Nursery Incorporated); CMU (Central Mindanao University) in Musuan, Bukidnon; and the Malasag Ecotourism Park in Cagayan de Oro City. In MOSCAT, the educational tourists were exposed to various income generating agroforestry projects, courtesy of Dr. Elpidio Bautista, President. They were also lucky to have been able to visit the ICRAF which a is located inside the MOSCAT campus. ICRAF is an international non-government entity which is engaged in agroforestry research and funds projects along this line. In Mindanao, the agency is headed by its Research Manager, Dr. Agustin R. Mercado. CTNI, on the other hand, showcased the tree cloning technology and showed the students their clonal nurseries which boasts of about five species of trees propagated, the resultant seedlings of which are sold as materials for commercial tree planting by big companies nationwide. Meanwhile, the visit at the CMU was made possible through the generosity of its OIC President, Dr. Victor M. Baroso who saw to it that his student guests did not miss the important agroforestry features of his school which included a rubber processing plant; a goat raising project; a sawmill plant; a dairy farm; and the Carabao Center which happened to be located inside the CMU campus. At the end of the day, the students warmed up to the great possibilities of venturing into agroforestry entrepreneurial ventures after witnessing what they have seen during the tour. They saw the vast horizon of a promising future awaiting their conquest as environmentalists. After filling their brains with the novel and exciting bits of information gathered during the study tour, the students, together with their teachers, were ready for a much needed refreshing break and took off for the well-known Malasag Ecotourism Park in Cagayan de Oro City.